When it had sunk in that I would definitely be going to the Cape, for the Caine African writers’ workshop, I made the necessary preparations. I woke up very early, at around four o’clock in the morning of 5th March 2012. I had a flight to catch scheduled for seven o’clock from Harare. And my brother-in-law, Nicholas Tachiveyi took me to the airport in his personal car, before he proceeded to his workplace. It was my first time to go to the airport, let alone board a flight. Yet despite my anxieties, I discovered that the procedures at Harare International Airport were not complex. In no time, we were taxing on the runaway. I hadn’t buckled up and when the plane began its ascent I felt like I was floating on a giant Ferris wheel. I experienced a powerful thrust as my body fell back onto the seat. Our Boeing was flying the colours of the national carrier South African Airways. By the time we hit cruising speed was when I remembered to adjust my seat then buckled up. I was thrilled. Unfortunately, from the middle seat I couldn’t see much of the outside. I ate the food they provided and was even brave enough to have a coke, which I regretted later. My stomach reacted in violent cramps. Ordinarily I avoid drinks made with anything other than fresh ingredients. For certain preservatives tend to hurt my stomach. As we approached O.R Tambo International Airport for landing, I marvelled at the airplane descending and curving. But for some it was scary. It dawned on me that I could enjoy flights more than road travel. Previously, car journeys sometimes made me retch badly. Without preamble we hit the runaway. It was a firm nudge as the plane made contact with the tarmac. I had checked in my bag at Harare International Airport, so when we arrived in Johannesburg, I was embarrassed to note that people were taking their bags from the overhead baggage bins. I wondered whether mine would be there too, and I even ensured that I was last to exit the plane. I searched for my bag in all the compartments. I was so convinced that my bag had been stolen –until I checked with the flight attendant. She asked me whether I had brought it inside the plane with me. I said no. She then informed me that I should check for it on the arrivals carousel. I felt utterly embarrassed. From O.R Tambo International Airport to Cape Town International Airport, I was comfortable. I had problems with undoing my belt though, luckily I was helped by a fellow passenger. That time, it wasn’t that embarrassing. I don’t usually get embarrassed, as I tend to rationalise such feelings. Things are simply normal even though I’m in fact a little ignorant about them, or find them too complex or strange. The administrator of the Caine prize, Lizzy Attree, had said that we were to meet at the international arrivals hall. And that’s where I was waiting for the others. But it seemed nobody had showed up yet. After an hour, I went to the phone booths and tried phoning her. But I couldn’t reach her, and it made me quite desperate. Fortunately this episode was over two hours later when I walked up to a stranger selling treats at the international arrival hall. I asked him whether I could use his cell phone to call someone, and gladly discovered that he was Zimbabwean too. So we conversed in our language, Shona. It’s in this spirit that he helped me connect with Lizzy. She directed me back to the domestic arrivals hall, where I had already checked several times for the group. I didn’t know anyone in the group personally, moreover I had only linked up with two of the writers on Facebook –a few weeks earlier. I met Mehul Gohil and Lauri Kubuitsile before the three of us finally met up with the rest of our contingent. Percy Tours took care of our travels. At around four in the afternoon, we were on our way to Hermanus, Volmoed, where we’d be spending the entire ten day workshop. The one and a half hour drive took us through some of the most beautiful scenery in South Africa. The landscape is scored with gorges, rivers and mountains. You sometimes see granite or limestone outcrops resembling bones jutting out from the mountains. Rivers at times shone like a silver scimitar cutting down through the mountains as they went down to the sea. Higher up on the mountains tended to be sparsely forested compared to the lush estuaries. When you drove ahead determinedly, it felt as though the sea threatened to gobble up all the land. Against it, smooth roads seamlessly wove through the landscape. In the light of falling sun, the surface of the sea was like a cracked or shredded but still intact pane of glass. In the evening light, everything was lent a halo of amber. It was an awesome sight to behold. And I was enjoying it immensely, despite my violently irritated stomach. The car I was in was shared with a South African lady called Grace Khunou, a Kenyan lady called Brenda Mukami Kunga and Lizzy Attree. The rest were in the second car. Lizzy asked me about Dambudzo Marechera, the iconoclastic Zimbabwean writer. In the newspaper she had been reading there was an article written about Dambudzo. She mentioned something about how Dambudzo had infected Flora Viet Wild (his biographer) with HIV, and how it had taken her that long to spill the secret out. Which I later read about online in the essay Me and Dambudzo: a personal essay by Flora Veit-Wild. I could barely reply to Lizzy. Lizzy couldn’t have known how I was suffering inside. I am sure she could have understood me to be just a shy person; in fact that’s what she told me later on. Maybe, I am generally shy, but then it was made worse by the stomach cramps. Later I told Lizzie that I had never been to any ocean, let alone the sea. She was surprised. But that didn’t bother me. I couldn’t wait for the journey to end so that I could find relief. Eventually we reached Hermanus. It’s an awesome town with pretty buildings. Most were painted off-white, light grey or green, with a smattering of shades of brown in between. It was reminiscent to a Mediterranean Riviera setting – to me at least, or an Eastern European seaside town. We stayed in Volmoed in the scenic Hemel en Aarde Valley, which is a 15 minute drive out of Hermanus. The Hermanus district is predominantly occupied by the coloured population. Culinary tastes are conventionally South African, which means there is an eclectic choice resultant from the diverse communities that make up this area. These ordinarily range from African foods, sauces and dressings to European continental tastes. Hemel en Aarde literally means valley of heaven and earth, and I knew I was in a very special place. Once you are inside the valley, the vista appears to reach out to the heavens. “This particular area in which Volmoed is located was earlier known as Attaquaskloof”, says John and Isobel De Gruchy, in their book, The Volmoed Journey. “The name Attaqua means the place of Atta, which suggests that a Khoi people lead by someone known by the name Atta did, in fact, live here long enough for the area to be associated with him.” In 1817, Lord Charles Somerset declared it a leper colony, turning the valley into a place of healing. Subsequently, the colony was moved in 1845 to Robben Island, the place Mandela would later be incarcerated for twenty seven years. Attaqua was subdivided into plots and sold off. One of the farms was named Volmoed, meaning “full of courage and hope”. 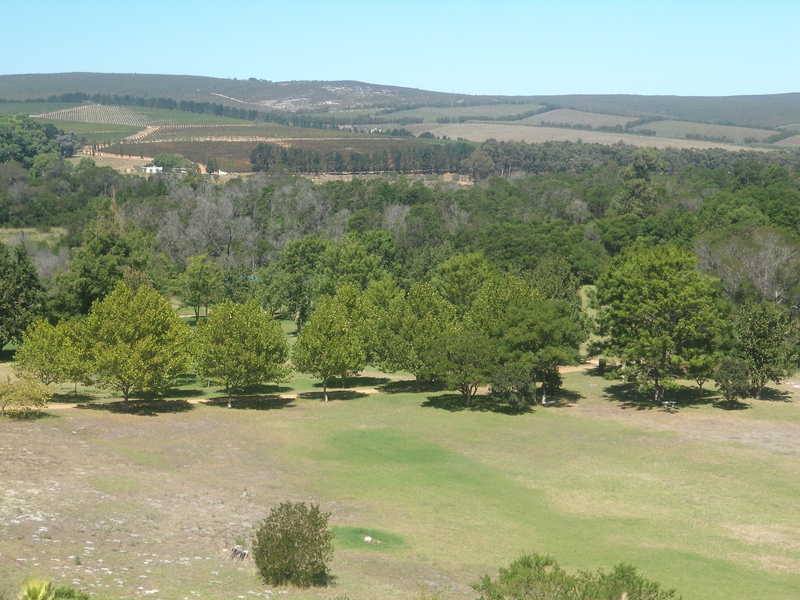 In 1986, the present Volmoed community purchased the farm. Bernard Tukstra currently runs it. An unfortunate realisation struck me about the place; not much of the Khoi people’s artifacts could easily be found around. Perhaps they had been obliterated by the white settlers as they systematically made advances against the Khoi. Perhaps the Khoi took their living secrets with them as they succumbed to new diseases, like small pox, for which they had no immunity. Franscesca Mitchel stated that in 1713, an estimated 90 percent of the KhoiSan population is thought to have been wiped out by smallpox. Most of the buildings at Volmoed have whitewashed walls and green roofs which seem to merge into the greenery. People were saying it had been the driest summer for years on the overberg. Because that whole area is part of the Cape over-berg, it means temperatures are significantly influenced by ocean currents. At any moment, it could get pretty chilly even in summer. Generally it was warm when we stayed there, but all the green belied a worryingly dry summer for the locals. In summer it’s hot and windy while winter is cold and rainy. Sometimes there is snow, especially higher up in the mountains, one of which is the Babilonstoring range. At times the melt water triggered floods down in the valley. 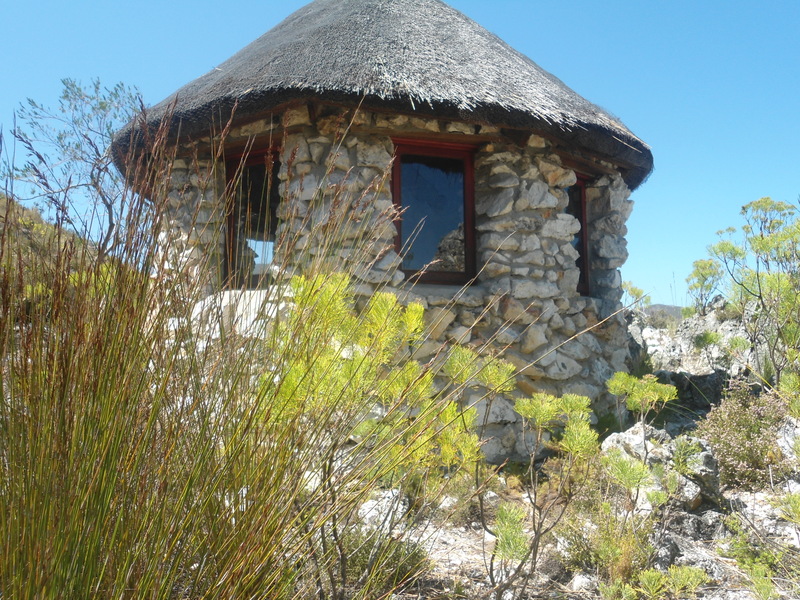 Our cottages were named Keurboom, Vyeboom and Boekenhout. 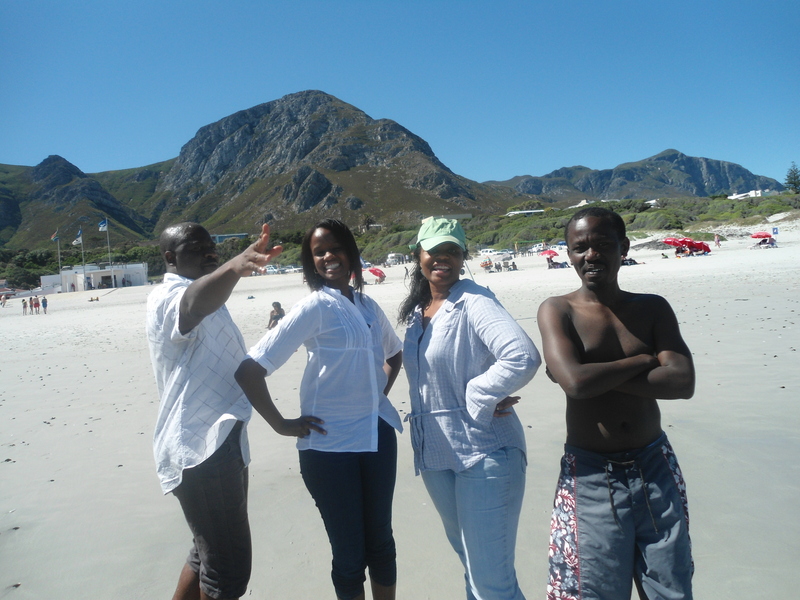 We shared a cottage among three –me and the Kenyans Mehul Gohil and Waigwa Ndiang’ui were in Keurboom. We each had a private bedroom, and shared the dinning/lounge, kitchen and toilet area. Outside our veranda was a leafy Keurboom tree. These cottages are built cutting into the edge of the mountain. They merge into the mountain unobtrusively, testifying to the skill invested in the project. For they respect the scenery, and make themselves part of it. It was not difficult to feel artistic at Volmoed, for the scenery felt like the delightful work of art. But actually it’s the spiritual centre of the Anglican Church of South Africa. People come there from all over South Africa and abroad on spiritual excursions. The staff at Volmoed were fabulous and very helpful, especially the owner and founder Bernard Turkstra, and the head chef Marie Philip. My stomach tends to be rather choosy, and it complained a bit, but after a few meals it was won over. I even sampled a new dish at every meal. I knew writing the story wasn’t going to be impossible in that setting. Hence I didn’t push myself as hard as I usually do. I lounged, ate well, slept well, and strolled the verdant grounds. Some writers – Waigwa in particular, joked that I came with a story already written. He argued that I was always fooling around while others were concentrating. That’s because I completed my first draft in a day. And it was only the second day after we arrived. I wrote in a single sitting of two hours, all between four and six in the morning. I knew the instructors wouldn’t like that but I went ahead and wrote it all the same. It was experimental and read almost like non-fiction. My story was based on the discovery of diamonds at Marange and its exploitation between 2005 and 2006. It fueled illegal mining, corruption and the not unanticipated killings of the artisanal miners by government forces. The larger story was to highlight how Zimbabwe was pillaged by the political establishment, through mismanagement and corruption. Marange had held the possibility of Zimbabwe’s rise from it’s current economic crisis. But now, that dream had been confounded for the majority Zimbabweans. Well, one instructor didn’t like the story. OK, maybe they liked the humor, but the experimentation meant that other themes were trampling on the real story. Both my instructors, Henrietta Rose-Innes and Jamal Mahjoub advised me to write the story in a clear and linear way. Because I knew I could not do that, I lost my initial excitement. I was captivated by the breathtaking scenery. One day I followed the Onrus river back, up to the mountains. It originated in the Babilonstoring range, then filled the De Bos dam, before cascading over a waterfall. Along it’s valley, it paused into a small pool near a place called The Grotto. Ten kilometres later, it reached the Indian Ocean. Onrus means restless. Hemel en Aarde, Volmoed, the Western Cape, South Africa. Tendai Mwanaka. March 2012. The Onrus is a gentle river, but sometimes after occasional snowfalls on the Babilonstoring Mountains, or after a particularly heavy rainy season, it can be restless; flooding the lower sections of Volmoed, washing away bridges, trees, and even drowning people. But the name came about because people down-stream feared that it might bring diseases from the leper colony. This made them anxious and restless, thus the name. Bird life is abundant, and I saw some thrush, red-cocked woodpecker, yellow-billed ducks, doves, white backed ravens, witoogies, sunbirds, and the cape sugarbird. Other wild life found in this area include baboons, leopard – outside the park areas in the temperate Cape areas; especially in its mountainous areas, beetle, puff udder, cape cobra, boomslang, and reebok. We did create a lot of stories involving the baboons, and some of the more imaginative among us called them zombie baboons. Jamal and Lauri took the initiative to make up fantastical tales. Every night till late, we made up stories about how they might come and attack us. The most prominent plants I was looking out for were the fynbos, aristaes, proteas, white and mauve ericas, keurboom and smaller keurtjies, snowdrops, brilliant yellow daisy bushes, white plums, the imposing magnolias, camellia, azalea, stately oak trees in their new leaves, roellas, aulax putting out their feathery yellow stamens, orange ursinia, and the tiny geissorhia. On this journey up the river, I was with Beatrice Lamwaka, a Ugandan writer. We walked up midway the journey with Waigwa. He preferred to return to Volmoed to work on his story. Beatrice and I talked mostly about writing, her work as reviewer of books in Uganda, the literary scene in her country, and their promising publishing initiative with Femrite. 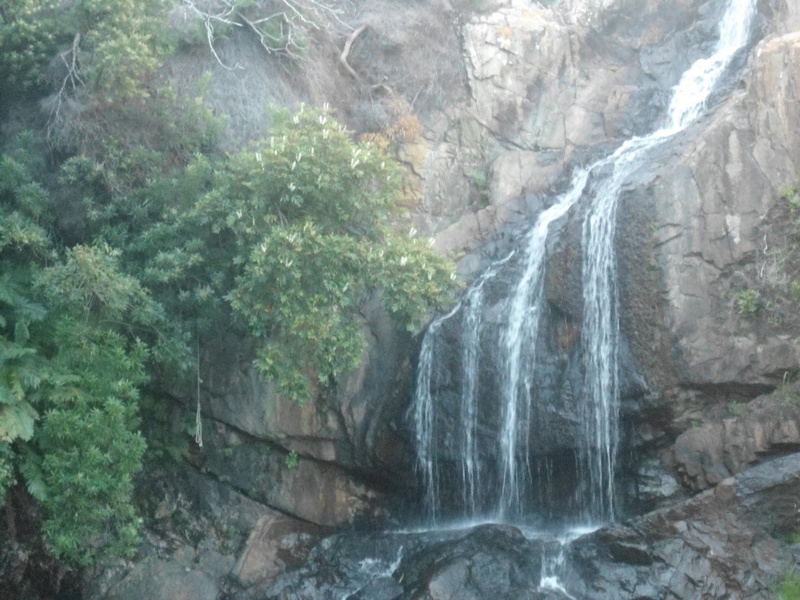 I really wanted to get into the waterfall or at the very least get close enough to touch it. When I got near it, I felt like I was a part of it. Below was a deep green pool. I was not sure how deep, but anything that appeared too deep has always scared me. So I could not begin to imagine what might lie inside. I imagined water animals that I’m not fond of: snakes, mermaids, and crocodiles. But, I was mostly scared of the Njuzu that day, so we enjoyed it from the outside. It’s not a joke, I am afraid of these aquatic half human creatures. In my culture and country, these creatures are associated with supernatural forces, for instance it is believed the most potent traditional healers is of the Njuzu calling. It is said that they were often people who had been abducted by a Njuzu and secreted deep inside caves, in the river’s pools, where they would be taught the trade. So growing up, we were always afraid of river pools that were said to have Njuzu in them. Afraid we might be abducted by these supernatural creatures. It is also believed that should people mourn for you after your abduction, these creatures would kill you. Thus you can understand my fear of these creatures at that instance. On the only day that we left our abode, we had an afternoon excursion to explore the area in the vicinity of the Clemsburg River. We boarded the The African Queen, a large, two storied river boat. I remained on the lower deck. Because I had never been to the sea, I requested Lizzy to take us there. She recommended Grotto beach. Since I had never been to the sea or ocean, I took it as a thoughtful present. The water was chilly but I got inside and waded for nearly an hour. It struck me that beaches are not actually blue, as depicted in pictures. This one had white sands and where the waves crashed, the water was off grey, but clean. Then we frolicked on the beach until it was time to return to Volmoed. 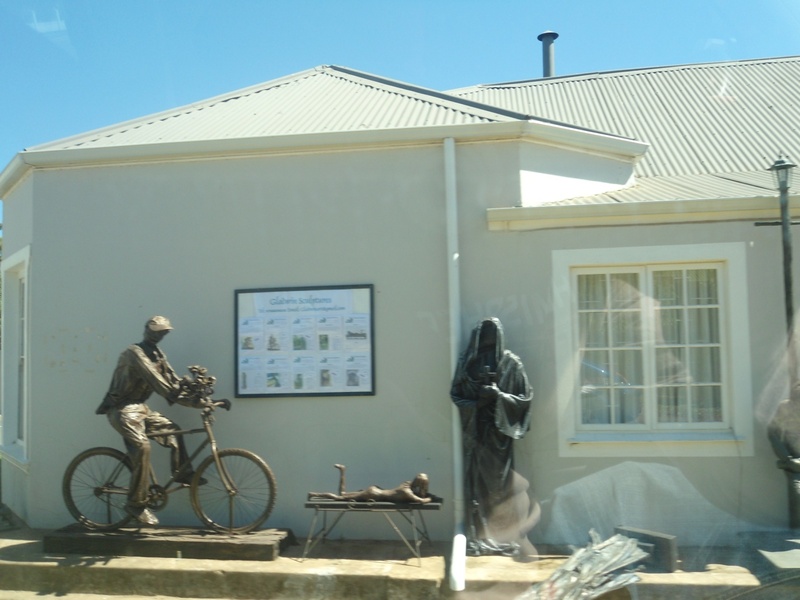 As we passed through Hermanus again, we caught sight of intriguing public art and a beautiful brown tiled chapel. March 14 was our last full day at Volmoed, by which date we had finished writing our stories. To mark this milestone, Brenda, Beatrice, Waigwa and I climbed nearby mount Kleinbergie. It lies just a short distance across the Onrus river. We wanted to see the mountain and the dam. In the previous year’s Caine Anthology, South African Ken Barris had written a story To see the Mountain. It was based on his attempt to climb mount Cameroon. We felt we were on a similar jaunt. But what was additionally driving me and Waigwa was the desire to see the dam. We had been told there was a dam on top of the mountains, the De Bos dam. As we ascended, we found The Pine Pond midway up the mountain. It was full of wild flowers and weeds. We argued for minutes whether this was the dam or not. Eventually we concluded that it was too small to be a dam. We agreed to keep climbing the mountain, rather than take another path away from this range. I realized belatedly that that path would have gotten us right up to the dam. Brenda was too tired to go on, so we decided to abort our trip. We hadn’t found the dam. As we descended, at the pond we found Rehana Rossouw. Since she is South African, we asked her whether that was the dam. Just to be sure. She said it was and all our arguments ended. Waigwa and I still believed that there was a bigger dam out there. For both of us, there was this sense that we had failed on our quest to conquer the mountain, or even to find a proper dam. Rehana told us there was a chapel, The Thanksgiving Chapel, to the other side of our writing retreat. Since I hadn’t been to that other side, she offered to take me there. I had already seen the two prayer places; The Prayer Hut on top of the mountain, and The Prayer Grotto, on the edge of the river. Both places were mystical to me. They inspired feelings that overwhelmed me. Both The Prayer Hut and the Prayer Grotto lay amidst the burial ground of the faithful who had lived in the area. In certain places lay urns bearing the ashes of the departed. I tend to be pensive in burial grounds. Sometimes I’ve had a feeling that the person buried down below can see and pity me. There was an element of fear and being laid bare at the same time. So, I didn’t stay for long at both places. The same anxiety gripped me in the chapel. But the presence of other people comforted me. The chapel grounds had an array of flowers and a pond accentuated by a well cut lawn. I imagined it as a place I might marry at one day. But I knew it would be a long way till then. As the chapel was closed to visitors on that day, we had no opportunity to explore what mysteries lay inside. Later, I read that it is filled with art and artifacts, some of which had come all the way from Zimbabwe. One of the notable pieces was a curved crucifix donated by a Mr. Roger Hickley. In that sense, it might not really have been a long way away for me. As we sat on the lawn a while later, several local cats approached us. I reached out and petted one with white fur, in spite of not being fond of cats. The following day, the workshop ended. I left with the first group of writers who had morning flights out. I left for Cape Town international airport and waited for my afternoon flight to Johannesburg. The rain was pelting down as I stepped off the plane. I had decided to make a short stay in Johannesburg, with the intention of seeing my brother and his family, and our extended family in the neighbourhood. On the return leg to Zimbabwe, I got the window seat. This time round it was truly awesome to be airborne. Fabulous cloud formations drifted past and at times they were below me. I imagined touching them, experiencing their cotton softness. These ranged from shades of grey to dusty brown, and sometimes we cut though storm clouds that shook the aircraft with turbulence. It was the sight of Chitungwiza city from high above that I enjoyed most, because it is essentially a well arranged village. Chitungwiza city is dormitory residential city 26 Kilometers south of Harare. Some of our most popular Zimbabwean artists hail from there. These artists include among others: Charles Mungoshi, John Chibadura, Alick Macheso, Leonard Dembo, and Thomas Mapfumo. This neighbourhood is fondly known as the Hollywood of Zimbabwe. The Hunyani River appeared like it was an artist’s impression of a blue string. Its source is around the Marondera area and flows between Harare and Chitungwiza, all the way down to Norton town. And then, we were taxing at Harare International Airport. My journey to Volmoed, the Western Cape had ended. Tendai Mwanaka is a writer from Zimbabwe. Here is his profile. Francesca Mitchell, South African History Online, Public History Internship. Hermanus and Volmoed tourist information can be accessed here.